In this attractive volume, Simonetta Carr introduces young readers to the life, thought, and work of one of the most famous Reformers of the Christian church. She tells about the life of John Calvin from his birth to his death, placing him within the troubled context of the sixteenth century. 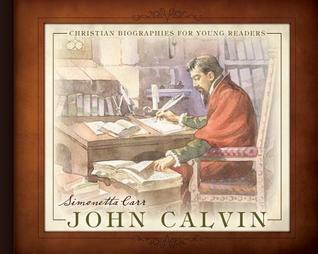 She also introduces Calvin?s writings in a way that children will desire to know more about his ministry and influence.Readers will come to know Calvin?s personality, his devotion to God and the church, and the personal challenges he faced. They will understand the struggles the early Reformed church faced at that time, not only surviving attacks of the Roman Catholic Church, but also achieving a clear identity and a unified doctrine. They will also have a glimpse of life in sixteenth-century Europe, stricken by pestilence, poverty, and wars. Simply written, and full of interesting facts, this book makes a great gift for children of this rich Reformed heritage.